Extend the range and reach of your security operations with Airborne Drones’ specialized multi-rotor UAVs. 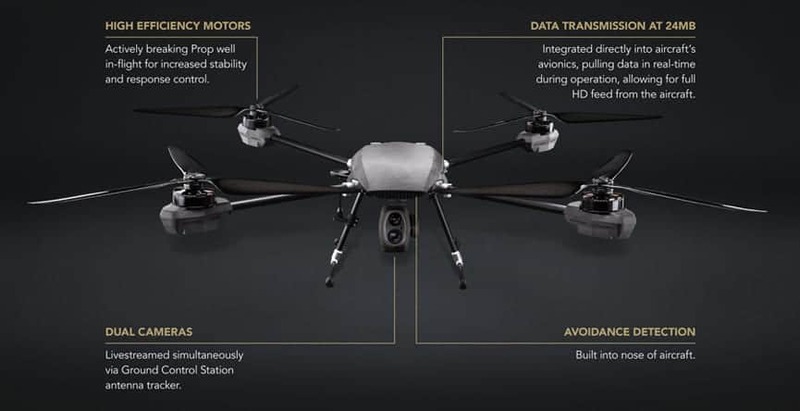 Our silent, high endurance multi-rotor UAVs provide long range and reach and are low cost, making them the preferred choice for customers around the globe. In addition to our UAV platforms, we also provide sophisticated integration platforms (Gimbals) to carry high-end sensors, such as methane detection and Lidar. The ability to carry powerful dual/multi-sensor payloads, combined with the top of the range datalink capability, makes Airborne Drones UAVs ideal for both VLOS and BVLOS missions, in a diverse range of security and search and rescue applications. and a range of fixed wing UAVs (3 – 6hrs, up to 10kg payloads). By submitting this form, you consent for your details to be sent to Airborne Drones and its authorized partners in order to respond to your inquiry. Depending on the location of the organization, your personal information may be transferred and processed outside of the European Economic Area.